• Reliable, quality water for a sustainable economy. This information can be used for regional and sub-regional water and land resource management planning and decision-making. Using criteria identified by regional stakeholders, it identifies the most valuable areas in terms of watershed management. The current human disturbance footprint was overlaid on these areas to identify valued areas that are also potentially vulnerable. The purpose is not to create a new land use management zone, but to improve watershed management planning by highlighting "hot spots" that may require more attention. This approach is repeatable over time. It can ensure that future state of the watershed reporting is responsive, adaptable, and supportive of environmental planning in the Mighty Peace. As priorities evolve, additional valuable areas may be identified by stakeholders and easily added as a layer in this assessment. Source areas (watersheds) for municipalities that take water from smaller, less reliable, surface drinking waters, such as smaller tributaries and lakes, which are more vulnerable to land disturbances or pollution. 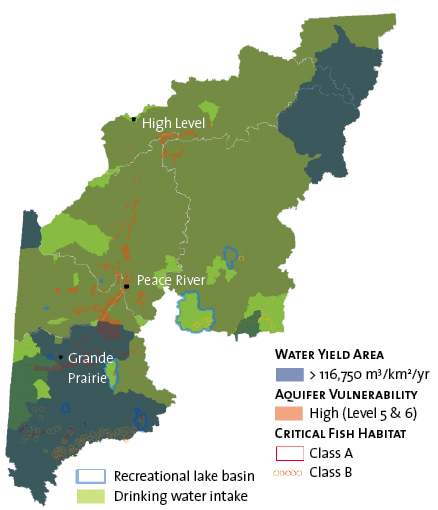 High water-yield areas with a high rate of flow that protect freshwater supplies for human and wildlife use. 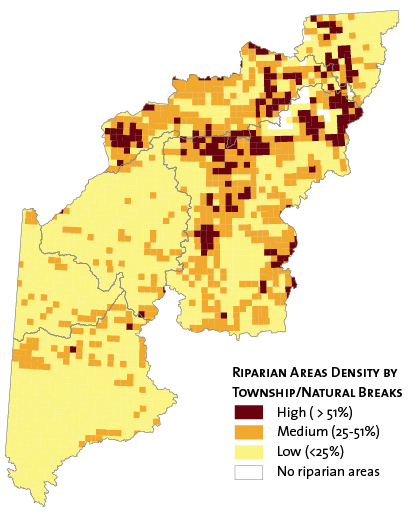 In these areas, land disturbances or pollution are also more likely to move to aquatic ecosystems. Critical fish habitats that are the most significant and sensitive in the province and thus have the highest level of protection. Important recreational lakes, as listed in the Atlas of Alberta Lakes.36 Lac Cardinal is particularly important because of its connection with the Grimshaw aquifer.